Successfully Added Darth Vader 3D LED Light - 7 Colors, 2 Light Modes, Power Through Micro USB Or AA Batteries, 5Watt to your Shopping Cart. This Darth Vader LED light is the perfect gadget to show off your love for Star Wars and support to the Dark Side. Available now at Chinavasion, this 3D LED Star Wars light is a great accessory for everybody out there that loves Darth Vader and, additionally, is the perfect gift to all Start Wars enthusiasts. With its unique design, this creative 3D LED color light is great to be used as a decoration piece in your living room, child’s bedroom, or computer room. By emitting a smooth and colorful light, this 3D LED lamp is sure to set the right atmosphere for any occasion. The Darth Vader creative 3D LED color light features two different light modes and seven colors – assuring that it will meet the likings of anybody out there. Simply use the light’s button to switch in between the different colors and light modes this Darth Vader LED has to offer, and you’ll be able to enjoy stunning visuals and smooth colorful light at any time of the day. Its two different light modes allow you to either enjoy this Star Wars light in the one color you love most or to select the automatic color change mode in which it smoothly switches in between the 7 different colors supported by this beautiful 3D LED decorative light. Coming with both a micro USB port and regular AA battery slots, this Star Wars LED light can be powered either through the included USB cable or with normal AA batteries. 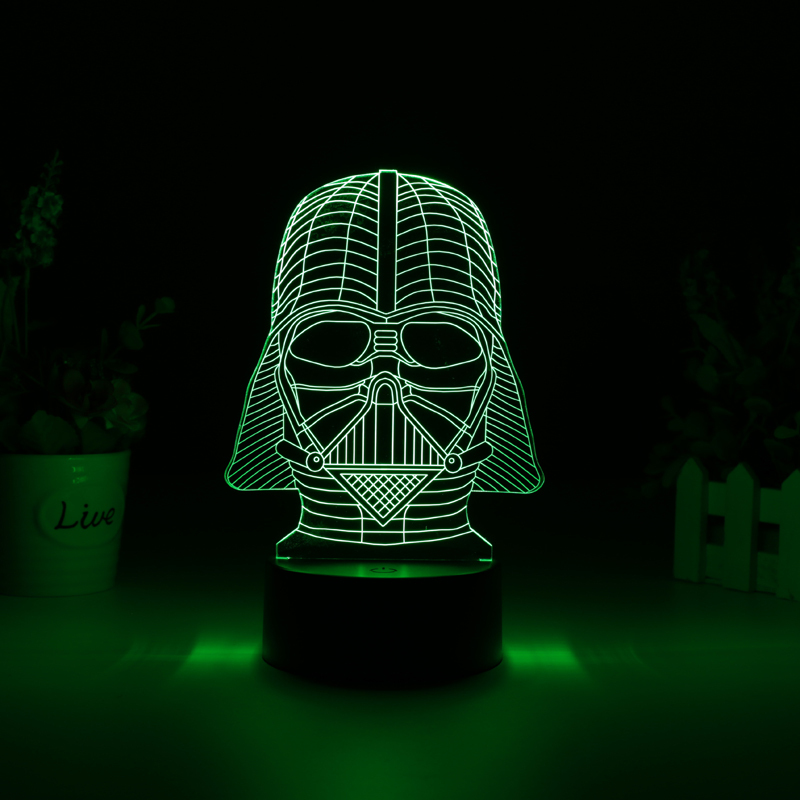 Thanks to its 5 Watt power, this Darth Vader light emits a smooth and dimmed colored light - creating a peaceful and calm environment that will be lit up in your favorite color. Perfect as a decoration piece or to be used to set the right atmosphere in your bed or computer room – this Star Wars light is a great accessory for all sci-fi lovers out there. 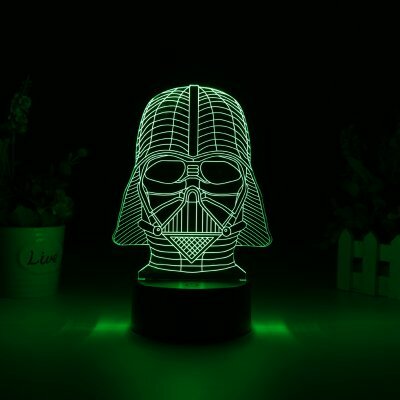 Crafted out of durable acrylic material, this 3D LED Darth Vader lamp features a safe to use and environment-friendly design. With its absolutely stunning and colorful light effects, this 3D LED light truly is a great gift for anybody that has a fascination with Star Wars or Science Fiction in general. Simply slide in your AA batteries or connect the USB cable to its micro USB port, select your favorite color, and you’ll be ready to sit back, relax, and enjoy a smooth and beautiful 3D light effect. With its stunning visuals, this Start Wars 3D LED color light is guaranteed to spice up the interior and atmosphere of your kid’s bedroom or computer room. This Darth Vader light comes with a 12 months warranty, brought to you by the leader in electronic devices as well as wholesale electronic gadgets..
Arabic: - الضوء لون الصمام ثلاثي الأبعاد - Chinese Simplified: - 3D LED 颜色光 - Czech: - 3D LED barevné světlo - Dutch: - 3D LED-kleur licht - French: - Lumière de couleur LED 3D - German: - 3D LED-Farblicht - Hebrew: - אור צבע LED 3D - Hindi: - 3D रंग एलईडी प्रकाश - Hungarian: - 3D-s LED színes fény - Italian: - 3D LED colore luce - Japanese: - 3 D の LED 色光 - Korean: - 3D LED 색 빛 - Malay: - 3D LED warna cahaya - Norwegian Bokmål: - 3D LED-farge lys - Romanian: - 3D LED culoare lumina - Russian: - 3D цветной светодиодный свет - Spanish: - Luz de Color LED 3D - Thai: - แสงสี LED 3 มิติ - Turkish: - 3D LED renk ışık - Vietnamese: - 3D LED màu sắc ánh sáng.